The temple of Treania, goddess of waters, and her 4 divine children, has been raided by a madman and his cultists, attempting to call forth an elder deep one, who ostensibly should consume the temple’s essence to become a god. Here, we have a problem with the premise: For one, it’s pretty easy to slot a sea-goddess into the campaign – but her AND 4 divine offspring? That’ll require some justification. Furthermore, in pretty much all campaigns I know, divine ascendance is more difficult than just defiling a temple. Add to that the fact that many campaigns consider mythos-related beings to be somewhat beyond the usual divine cosmology and the fact that these things already have the deific quality and I’m a bit torn there. So yeah, this’ll take more effort to slot into the game than usual. Now, a significant part of the complex is just wading through ruins – then, the PCs get to defeat blood golems made from sacrificed priests. The main draw of this module, ultimately, is stumbling into the ritual, where mad cultists are being squashed as the elder deep one is called. Here is a bit of an issue: The idea here is awesome: Defeat the cultists, while tentacles flail around. Neat, right? Well, the elder deep one has a staggering aura that may, if things go bad, mean game over pretty quickly. The write-up also seems to be confused regarding WHAT an elder deep one is, mentioning tentacles in the flavor text that the creature simply does not have. Another aside: The BBEG…has a total of 45 hit points. Yeah, at level 9, even coughing at the dude will wreck the ritual. If the PCs have a moderately competent archer cohort, he’ll suffice to take out the boss in one round. 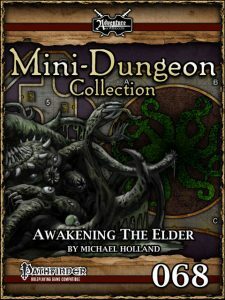 Michael O. Holland’s awakening the elder is, premise-wise, amazing. That does not change that the module uses the wrong mythos-creature, choosing one of the few that are not balls of tentacles. The module would have been well-served by making the entity behave more like a hazard. Using the creature makes for some awkward interactions. The needless wordcount expended for a deity you won’t care about is also a drawback. All in all, not really bad, but also not good. My final verdict will clock in at 2.5 stars, rounded up due to in dubio pro reo.